Are you a man who shaves regularly? If so, you know how painful and frustrating razor bumps can be. So let’s take a quick look at how to get rid of razor bumps. According to Murphy’s Law, this misfortune will always occur just before going on a special date or before heading to work. With all jokes aside, this shaving mishap is not all your fault. It happens to men every day. Continue reading to find out what they are, what causes them; and most importantly, how to get rid of razor bumps. The explanation of razor bumps is kind of gross. These tiny bumps commonly occur right after shaving, but they can appear hours or days later. It all has to do with the way hair grows. There are actually two different kinds of razor bumps. The first kind occurs when a hair follicle becomes trapped underneath the skin before it has time to emerge. This causes the skin around the hair follicle to become raised, swollen, and painful. The second kind of razor bump occurs when hair emerges from the skin, but curls and re-enters the skin. This causes a dark-colored bump to surround the hair follicle and can eventually turn into a scar if not treated properly. Contrary to popular belief, razor bumps are not razor burn. A razor burn appears after too much friction has been applied to the skin or when the area has been shaved too aggressively. On the other hand, razor bumps are caused by ingrown hairs, there is a huge difference between the two. Razor bumps happen as a result of using a device or method that is not suitable for thick or curly hair. Shaving against the grain tugs at the hair and pulls it away from the skin before slicing it. This allows the hair to be cut beneath the skin, causing ingrown hairs. Always shave with the grain to avoid bumps. Pulling at the skin to get a closer shave is a big no-no. Once the skin is popped back into place, this causes the freshing cut hair follicles to be covered by the skin.. This leads to hair growing underneath the skin and causes razor bumps. Applying too much pressure while shaving also causes the hair to be cut underneath the skin. Just don’t do it. Using multiblade razors can cause the hair follicles to become inflamed. If the blades are placed too closely together, they can tug at the hair and break it off beneath the skin. Stick to a single blade razor. 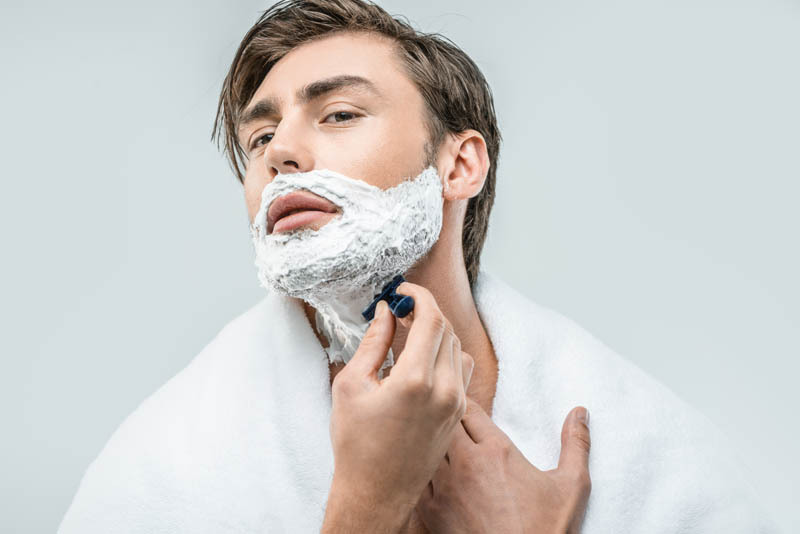 Not prepping the skin before shaving can cause razor bumps. It’s important to lather the area with shaving cream or gel beforehand. It’s also good to wash the area with hot water before shaving, as it opens up the pores. Here is a list of remedies for anybody wanting to know how to get rid of razor bumps. Tea tree oil has been proven to prevent and heal razor bumps. Why? Because it has antiseptic and antibiotic properties. Bacteria will slow the healing process and make problems worse if not dealt with, but tea tree oil removes bacteria and cleanses wounds. Simply add 3 drops of tea tree oil to one tablespoon of water and apply it to the skin 3 times a day. Applying a cold press to the affected area several times a day can greatly reduce redness and swelling. Place 2 ice cubes in a paper towel and put it on the bumps for 5 minutes when they become irritated. Aspirin isn’t just for curing headaches. An aspirin paste works by killing the bacteria that have entered the hair follicles. It also soothes the bumps and decreases swelling. Crush up an aspirin and mix it with 1 tablespoon of water. Apply the paste to the affected area and rinse off after 10 minutes. Aloe Vera is known for soothing irritated skin, but it can also rid your face of razor bumps. The antibacterial and anti-inflammatory properties soothe skin and reduce the appearance of bumps. Simply rub aloe vera gel or lotion directly on the bumps and allow it to soak into your skin. Rubbing alcohol works by getting rid of bacteria and drying out the bumps. Pour rubbing alcohol onto a cotton ball and apply it to the razor bumps. To help prevent future infections, you can also clean your razor with rubbing alcohol. Witch hazel is often suggested for medical uses. This is because witch hazel is a potent antibacterial and anti-stringent. It will cleanse the affected area, reduce redness, and soothe irritated skin. Apply witch hazel to the razor bumps and let your skin absorb it, no need to rinse it off. Baking soda works by relieving inflammation and gets rid of the stinging and itching sensation caused by the razor bumps. Mix one tablespoon of baking soda with one cup of water. Dip a cotton ball into the solution and dab it on the skin. Allow it to dry before rinsing it off with cold water. Though it may sound strange, store-bought tea bags are great for reducing swelling and redness. This is because the tannic acid present in the tea has anti-inflammatory properties. Soak the tea bag in hot water and apply it to the affected area for several minutes. Corn starch is likely something you already have in your kitchen cabinet. It helps by reducing swelling and soothing skin. Apply it to the bumps for 20 minutes, rinse off and repeat when needed. Lemon juice kills bacteria and prevents bacteria from entering the wounds caused by shaving. Squeeze lemon juice onto a cotton ball and apply it directly on the bumps. Allow the juice to dry then rinse with cold water.